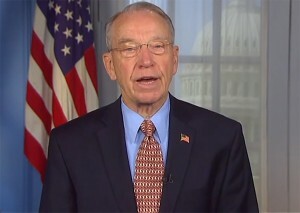 U.S. Sen. Chuck Grassley (R-IA) took to the Senate floor this afternoon to discuss the nomination of George Hanks to be a District Judge for the Southern District of Texas. He also used the opportunity to respond to Democrat criticisms of the nomination confirmation process. Tonight the Senate will vote on the nomination of George Hanks to be a District Judge for the Southern District of Texas. If confirmed, Judge Hanks will be the President’s 309th judicial nominee confirmed since he took office. By comparison, at the same point in his presidency, President Bush had only 273 judicial nominees confirmed. Despite some of the complaints we’re hearing from my colleagues on the other side, we’re moving judicial nominees at about the same pace as we did at this point in President Bush’s presidency. One difference, of course, is how the Senate handled the judicial nominees that were reported out of Committee during the lame duck. Historically, the Senate doesn’t confirm judges at the end of a Congress if those judges are reported out of Committee during the lame duck. The reason for this, of course, is so that the newly elected Members have an opportunity for their voices to be heard. For instance, that’s what happened in 2006, when the Senate returned 13 judicial nominees to the President. Those nominees were then re-nominated in 2007, and confirmed in the new Congress. But Senate Democrats didn’t follow tradition last year. Instead of following standard practice, Senate Democrats confirmed 11 judicial nominees who were reported out of Committee during the lame duck session. Had they followed standard Senate practice, we would’ve voted on those 11 nominees at the beginning of this year just as the Committee did with the nominees that were resubmitted in 2007. At the end of the day, when we include the 11 district court nominees that we confirmed at the end of last year, we’re at about the same pace as 2007. That is further confirmed when you compare the Committee’s work this year to 2007. In 2007, at this point in the Congress, the Committee had held three nominations hearings for a total of ten judges. As of right now, the Judiciary Committee has already held four nominations hearings for a total of ten nominees. These nominees include six judges and four executive nominees, including both the attorney general and deputy attorney general nominees. The bottom line is the Senate Judiciary Committee is treating the President’s nominees extremely fairly. He has had dozens more nominees confirmed than President Bush did at this point in his presidency. I expect another one will be confirmed tonight, and I congratulate Judge Hanks on his pending confirmation.